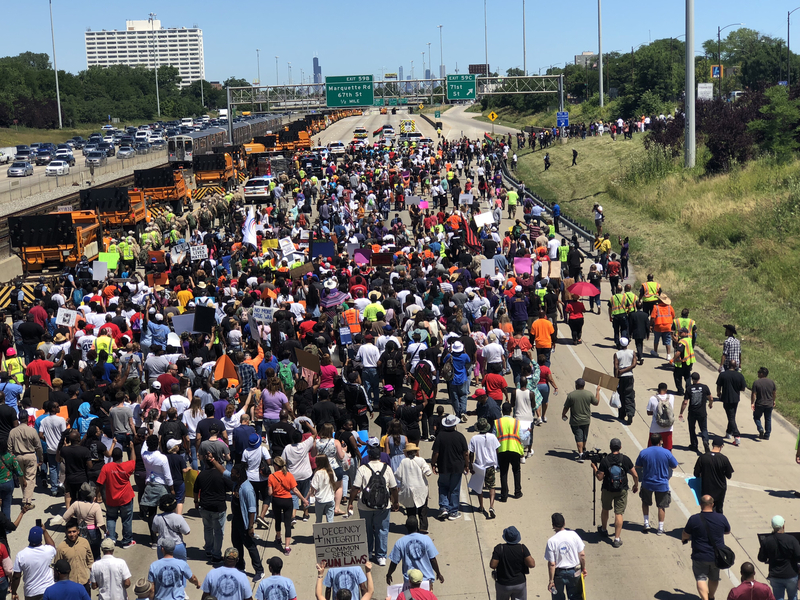 State officials said they could have two lanes of a major Illinois thoroughfare, but the anti-violence activists led by Chicago priest Michael Pfleger said they had one goal today: shut it down. And after at least 45 minutes of negotiations between Chicago Police Superintendent Eddie Johnson (on behalf of protestors) and state officials, the protesters did just that, closing the northbound lanes of the Dan Ryan Expressway for an hour for their northbound march, with the Chicago skyline glittering in the distance late Saturday morning. The goal, Father Pfleger said, was to grab the attention of political leaders who, he says, have the power to curb violence and bring jobs and better education to the city’s south and west sides. “The children are going to lead us,” Father Pfleger said at the start of the march, a nod to a group of young activists who walked in the front of the protest. Other organizers included Chicago Strong, Gather Activism and March for Our Lives Chicago, according to The Chicago Sun-Times. Police eventually closed both of the remaining open lanes, eliciting loud cheers from people gathered on a highway overpass just north of the protest site. Marchers then proceeded about a mile north along the northbound side of the highway, which remained closed for about an hour. Dozens of Chicago Police officers rode bikes ahead of the protesters, and members of the Illinois State Police marched behind them. Back at the starting point of the protest, motorists exited their cars to stretch as they waited for the road to reopen. “The children are going to lead us,” Father Michael Pfleger said at the start of the march, a nod to a group of young activists who walked in the front of the protest. Among the marchers was Kim Woodard, who brought her 7-year-old grandson David, both members of Father Pfleger’s parish, Saint Sabina. Ms. Woodard told America that she lives in the neighborhood where the march took place. Erica Kimble said she was marching because gun violence had affected her family: a shooting involving her niece last month. Chicago saw near-record levels of gun violence in 2016, and while the number of shooting victims is down from this time last year, close to 1,400 people have been shot, including dozens under the age of 16, according to The Chicago Tribune. In the days leading up to the protest, state officials urged Father Pfleger not to move forward with plans for the march, citing potential threats to public safety. But Chicago Mayor Rahm Emanuel threw his support behind the effort, and in a statement released late Friday night, Cardinal Blase Cupich, archbishop of Chicago, also expressed his support. Chicago saw near-record levels of gun violence in 2016, and while the number of shooting victims is down from this time last year, close to 1,400 people have been shot. Marchers held signs provided by event organizers reading “We need good schools” and “We need common sense gun laws.” Others brought handmade placards, some taking aim at Emanuel, who said earlier in the week he supported the goals of the marchers. Others targeted Illinois Governor Bruce Rauner, who tweeted during the protest that he was doing all he could to keep the expressway open. The two politicians sparred on Twitter following the protest. Father Pfleger was joined by dozens of other faith leaders at Saturday’s march, where temperatures stayed in the mid-70s and the humidity was low. Among them was the Rev. Jesse Jackson, who said Chicago was divided, with the wealthier, and whiter, north side reaping resources at the expense of the south and west sides. “There’s a border between Texas and Mexico and there’s a border in Chicago,” Mr. Jackson said. As protesters exited the highway and made their way to buses provided by event organizers, Father Pfleger held an impromptu press conference and explained what activists wanted. He said that political leaders must agree to sit down with the young activists who led the march. As someone who had from me young age (elementary school) been interested in political matters, and has written letters to political leaders and newspapers regarding the injustice and violence of legal abortion, I'm glad that Father Pfleger led a rally to demonstrate the need for our elected officials to pass reasonable laws to address the many needs of society. As a Special Education teacher (now retired) instructing students with brain damage, physical disabilities, and/or behavior disorders, I believe that access to good education (not only in academics but character education as well) can make it more likely that young people can find decent jobs. I also support stringent gun control laws, although I know that with any law, some people will choose to violate such laws. When my Dad died in 1994, I discovered a handgun in his bank safety deposit box. (I believe that the gun had belonged to my late uncle, and that my Dad chose to keep it away from our home). I immediately turned the gun into my local police department. I feel strongly about this matter, and support gun buy back programs (when people receive a sum of a money from the government for turning in guns to the police). For some years I have been a pen pal with a man serving life imprisonment for a serious crime. From our years of correspondence, I believe that as a devout Jehovah's Witness that he's reformed his life, and I support prison reform (both making prison environments more humane while keeping prison guards safe, as well as providing educational opportunities for prisoners so that when or if they're_released they can be qualified to work). Ironically, my pen pal based on his interpretation of the Bible favors capital punishment. However, I oppose capital punishment for three reasons. First, because of the very real possibility that an innocent person will be wrongly executed. Second, because putting to death even a convicted murderer will not bring back to life the person who was killed. Finally, for moral reasons I believe that our society must not kill to try and solve social problems. I also support more funding for mental health services. I know several people who are mentally ill, (one of whom was my brother-in-law 's late brother who had schizophrenia) so I believe appropriate, effective mental health care must be made available. Finally, I agree with Cardinal Cupich that we should work to bring an end to a "culture of violence." As Catholics , we should join with people of different faiths (or none) to as St. John Paul I I described it to build a "culture of life." This will includes restoring the maximum legal protection possible to the unborn, as well as opposing capital punishment. Also, although I 'm_not a pacifist, I admire their convictions. I only favor war after all diplomatic efforts have been exhausted. Civilians must never be deliberately targeted, and I believe the use of nuclear weapons must never be used. The Democrats have been in charge of Chicago since before the Stone Age. So is voting for Democrats a form of insanity? Aren't Chicago teachers highly paid? Doesn't Chicago have very tough gun laws? The priest should be arrested. When a priest believes the government is the solution he has abdicated his vocation. He is a tragedy of tremendous proportions. I'm sure he was willing to risk arrest in protesting violence. And the police chief who walked arm-in-arm with him could have done it had he felt it was warranted. If Rahm Emmanuel supports your protest you must be doing something wrong! I would think that community organizations would avoid this neoliberal, calculating politician at all cost. Unless they've brought him to the stage where he is providing concrete resources, this is just a way for him to score political points. Nonviolent direct action--including the kind of protest in Chicago over the weekend--are all legitimate and (sometimes) effective. But I wonder if this was the case in this instance? Did this action bring the powers-that-be to its knees as, for example, sit down strikes did in the 1930s or the civil rights activists did in the 1960s when they filled southern jails? Is there a coordinated legislative/political campaign to bring about a living wage, affordable housing, job training, etc.? Less social activism and more "deep roots" organizing! Vince, you are right about the organizing. But I suspect that the main point of non-violent protests such as this one is to draw attention to the issues - to shine a spotlight on them - not to bring the PTB to their knees. And sometimes it can even bring the most jaded, heartless, cynical politicians to back off cruel policies that violate both American values and christian values. We saw this happen when the spotlight was focused on crying kids being forcibly removed from their parents, when reaching the US to try to request asylum. Requesting asylum is NOT a crime. One hopes that at least a few of the very comfortable affluent who go out of their way to avoid even seeing the poor in their midst might think about it and decide to help at some point. The help that is needed goes beyond soup kitchens. They need to support politicians who advocate for humanitarian, not to mention christian, treatment of ALL, including the poor, minorities, refugees, immigrants and others who were unfortunate enough to be born in the wrong places under the wrong circumstances. The rest of us should count our blessings (many of which are simply good fortune surrounding the place and family of our births) and reach out to help. Changing the structures that perpetuate injustice is the only long-range solution, but providing immediate help (food, shelter, healthcare etc) is critical until long-term goals can be achieved. And that does mean contributing to candidates who eschew greed and bigotry, by donating to their campaigns, and by working actively to get them elected. Pity how he comes across as quite the bully: "We came to shut it down and that's what we did" , "...give the resources we demand." Sort of like a child who gains strength from the people behind him, this one demands a legislation of utopia or, at least, his demands. What an astounding ego trip this man is on. And when he is made god and high ruler, as history has shown, watch out. Probably not a bad person but suffering from extreme delusions of grandeur and there is not one adult around to tell him, "No!" And really, it's not the government who has the solution, it's Father. Spare me from the idealogue parading as a Religious.